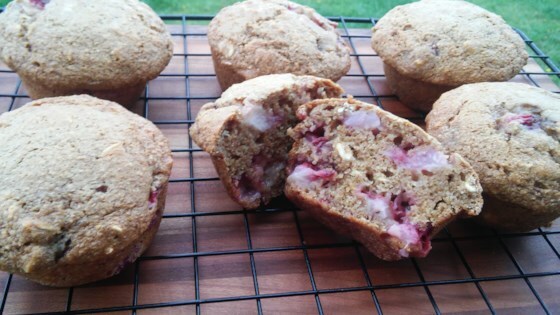 "These muffins were an experiment that actually turned out pretty good! My two-year-old could have eaten them all the day I made them!" Preheat oven to 350 degrees F (175 degrees C). Grease 2 muffin tins with cooking spray. Mix soy milk, applesauce, vinegar, and vanilla extract together in a bowl. Sift white whole wheat flour and whole wheat flour together into a separate bowl. Add oats, baking soda, and salt in a separate bowl. Mix in soy milk mixture until smooth. Let batter sit for 5 minutes. Fold strawberries into the batter. Fill muffin tins 2/3 full of batter. Bake in the preheated oven until muffin tops are brown and sides pull away from the tin, 30 to 40 minutes.